The new Patek Philippe Triple Complication Ref. 5208P is yet another accomplishment that underscores the leadership of the Geneva-based workshops in the complicated watch segment. With a minute repeater, monopusher chronograph, and instantaneous perpetual calendar, it presents the most challenging degrees of difficulty with peerless perfection. And it is not a one-of-a-kind timepiece: it is a new model in the regular Patek Philippe collection, offering definitive proof that the so-called "domain of the extraordinary" is part of the everyday reality at the privately owned manufacture. 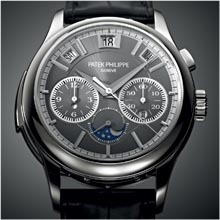 It is Patek Philippe's second Triple Complication within a short period of time. In 2008, the first was the Ref. 5207 with a minute repeater, instantaneous perpetual calendar with aperture displays, and tourbillon; in 2011, the second is the Ref. 5208P with a chronograph, minute repeater, and instantaneous calendar with aperture displays. Eagerly awaited by collectors and fans of complicated watches, it is the manufacture’s first Triple Complication with a chronograph. Moreover, the new Ref. 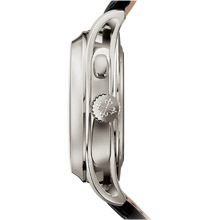 5208P is one of the very few existing highly complicated watches with a self-winding movement. Finally, it is the first true Grand Complication that integrates silicon-derived Silinvar® components: the revolutionary Pulsomax® escapement and the Spiromax® balance spring. As such, it is an impressive example of how tradition and innovation interact under one roof at Patek Philippe. Connoisseurs will appreciate that combining a self-winding minute repeater movement with a chronograph mechanism and an instantaneous perpetual calendar with aperture displays must have been a huge challenge for the caliber engineers and master watchmakers. The self-winding basic movement with the minute repeater mechanism did not allow the arbors of the chronograph to extend through the strike train from the back. On the other hand, the date, day, and month disks of the calendar must lie directly beneath the dial to assure the best possible legibility of the aperture displays. The only solution was to configure the chronograph between the repeater and calendar mechanisms. But even then, further difficulties presented themselves. The challenge was so monumental that the caliber engineers were relieved to have access to the manufacture's profound repository of experience. It was this know-how which made it possible to arrange the total of 701 individual parts in such a way that all functions harmonize flawlessly and dependably. Patek Philippe has always emphasized the aesthetic appeal of a timepiece in the development of new movements, and it is a mandatory criterion of the Patek Philippe Seal. For this reason, the chronograph mechanism with its column wheel and the horizontal clutch had to be made extremely thin to fit the space between the movement and the instantaneous perpetual calendar. In this respect, the Patek Philippe portfolio is a rich source: the caliber CH R 27-525 PS is the world's thinnest splitseconds chronograph movement with column-wheel control. It contributed the friction drives for the minute and hour counters that are not only very thin but also offset the torque differences between the coupled and uncoupled states of the chronograph, assuring that the amplitude of the balance remains consistent in every operating mode. Additionally, the toothing profiles of the chronograph wheels, also derived from this record-breaking movement, reduce wear and increase power transmission efficiency. Conversely, the patented self-setting hammers and brake levers were borrowed from the new CH 29- 535 chronograph movement. They automatically assure the optimum lever position relative to the respective counterpart without requiring that the individual contact surfaces must be ground to a few hundredths of a millimeter in a time-consuming process. Thanks to innovations of this kind and to the classic column-wheel and clutch-wheel control design, the overall height of the chronograph mechanism was reduced to 2.4 mm. The result is a three-phase chronograph with a monopusher at 2 o'clock that executes the start, stop, and reset commands when actuated in succession. The seconds and fractions of a second are measured with the large sweep chronograph hand while the continuously running counters at 3 and 9 o'clock display the elapsed time on a 60-minute and a 12-hour scale. The basics of its construction bears similarities with the Ref. 5207 launched in 2008, but the mechanism had to be extensively redesigned to accommodate the chronograph functions. Because the chronograph mechanism is layered between the calendar and the movement proper, it was not possible to simply route the cannon pinion through the chronograph wheel into the calendar module with the standard time and calendar data displays. For this reason, a detour had to be designed for the cannon pinion. Given the tight space conditions within the chronograph mechanism, it was a delicate task, and a considerable amount of research had to be conducted to develop the best possible solution. The cannon pinion is severed above the basic movement with the minute repeater. Its rotary motion is laterally shifted before it is transmitted through the chronograph mechanism, but then routed back to the center in the calendar mechanism which drives the hour and minute hands, the calendar displays, the day/night indication, and the moon phases. However, the subsidiary seconds hand is powered directly by an arbor that extends straight into the subdial at 6 o'clock. To distribute the force in the calendar module as economically as possible with the objective of assuring that all calendar displays will advance instantaneously and simultaneously at midnight ±2 minutes, the patented mechanisms of the Ref. 5207 were modified to match the new configuration of the movement. Considering that the disks for the aperture displays have much larger masses than hands, this was anything but a trivial task. A large, 15-part yoke makes sure that all calendar displays are advanced by one day at the very same moment. Additionally, an arrangement with two complementary lever springs that act in different directions assures that the switching force always remains constant despite considerable travel differences from the single-day jump at the end of months with 31 days to the four-day jump at the end of February when a non-leap year begins. This precludes incomplete switching cycles to a force deficit or overrides due to excessive force reserves. Given the fact that the Patek Philippe Triple Complication Ref. 5208 was endowed with an elaborate mechanism which instantaneously switches the calendar indications, the time display deserves special attention as well. Thus, the caliber R CH 27 PS QI movement not only has hour, minute, and seconds hands, it also features a minute repeater that indicates the progression of time with gentle yet distinctly audible sonority. The minute repeater is considered among experts to be the queen of complications. With a mechanism composed of filigreed racks and snails, tiny hammers, and delicate, freely suspended gongs in the confined space of a wristwatch, it demands the utmost of skill from the watchmaker. In over 172 years, Patek Philippe has advanced the art of repeater timepieces to an unmatched degree of perfection. When the owner of a Ref. 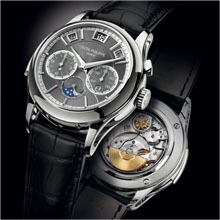 5208P actuates the slide, the result is a reverberant experience: first, the watch counts the elapsed hours on a low-pitched gong, then the number of quarter-hours with double strikes on both gongs, and finally the number of minutes that have passed since the last quarter-hour on the high-pitched gong. Many years of research were invested in finding the best possible steel alloy as well as in developing the shape and attachment points for the gongs – insights that are carefully safeguarded like state secrets. Among connoisseurs, the tonality perfected by the manufacture is deemed unsurpassed by any other wristwatch minute repeater. This sound quality – the manufacture's acoustic signature – is individually analyzed for each watch in a soundproof echo chamber and compared with numerous digitized sound parameters. But because the impression of resonance is always very subjective, every Patek Philippe minute repeater is also personally judged by President Thierry Stern or Honorary President Philippe Stern. They listen to the melody several times and then decide whether the exceptional timepiece is ready for delivery or must be returned to the workshops for acoustic optimization. Even though the sapphire-crystal case back of the new Ref. 5208P does not reveal the exciting realm of a chronograph mechanism, it does showcase a remarkable sight: the first Pulsomax® escapement and Spiromax® balance spring made of Silinvar® ever to be integrated into a Patek Philippe Grand Complication. Developed within the scope of the Patek Philippe Advanced Research program, the new components made of Silinvar®, a silicon derivative, have patented functional features that make them ideal for powering a coup de maître like the new caliber R CH 27 PS QI precisely, reliably, and continuously. Thanks to the excellent material properties of Silinvar® (hard, lightweight, nearly frictionfree, antimagnetic, corrosion-resistant) and the ingenious patent-protected part geometries, the efficiency of the innovative escapement is about 30% better than a conventional assembly made of steel. The energy gain is tapped entirely for the chronograph functions. Elegance and sleek understatement are pivotal hallmarks of Patek Philippe Grand Complication watches. They unite aesthetic design and elaborately engineered mechanisms in a harmonious whole. Legibility is another important criterion; after all, a Patek Philippe watch is always and primarily a timekeeping instrument. Accordingly, it was a considerable challenge to clearly arrange the 12 indications on the charcoal-colored solid-gold sunburst dial with a diameter of less than 40 mm. It shows hours, minutes, and seconds of standard time with a day/night indication; elapsed seconds, minutes, and hours of stopped times; the day, date, month, and year of the perpetual calendar; and not least the moon phases. The architectural result is so convincing that the new Triple Complication Ref. 5208 might at first sight be confused with one of Patek Philippe's popular Annual Calendars which display the calendar information in three apertures, including a particularly prominent date aperture, at the top of the dial. But the slide in the left-hand side of the case, the monopusher at 2 o'clock, and the two subdials immediately show that more than a perpetual calendar is involved here. And owners who are patient enough to wait until midnight can expect a rare extravaganza, especially on New Year's Eve. That is when, at midnight, the day, date, month, and year displays instantaneously and simultaneously advance to indicate the next following day, date, month, and year. People who know that movement wheels generally rotate continuously and at a rather leisurely pace can appreciate the fact that this instantaneous change of calendar displays is hardly achievable without an unusually elaborate ensemble of parts. And all these parts are accommodated in a case made of 950 platinum which in itself is unusual. It is not a conventional design with lugs that are integral to the caseband. Instead, it consists of three parts (back, middle, and bezel) that are clenched between and screwed to two clamps. Only this unique construction allowed the lugs to be pierced as resolutely and aesthetically as is the case with the Ref. 5208. They add charisma to a fusion masterpiece in which engineering virtuosity, mechanical ingenuity, finishing, materials, and design come together in harmony. It is worn on a strap for which, too, only the best is good enough: Shiny chocolate-brown, hand-stitched alligator leather with square scales, secured with a 950 platinum foldover clasp. Because of its limited availability, the Ref. 5208P will be sold exclusively in the Patek Philippe Geneva Salons during the introductory phase.